Addressing the historic “special relationship” between Britain and the United States, the British ambassador told a Duke audience Tuesday that America needs allies like Britain as it builds outward relationships and takes on challenges and risks internationally. “The quality of dialogue (between the U.S. and UK), the extent and depth of our collaborations around the world, and the fact that we’re both willing to make big sacrifices to defend what’s important,” all characterize the relationship between our two countries, said Ambassador Sir Nigel Sheinwald. Sheinwald discussed the historic relationship between the United States and United Kingdom and foreign policy challenges in the Middle East with political science professor Peter Feaver before an audience of students and faculty at the Sanford School of Public Policy. He was on a trip to North Carolina promoting business and investment and expanding educational links between the United Kingdom and United States. Sheinwald said more than 45,000 Americans study or work with academics in Britain. 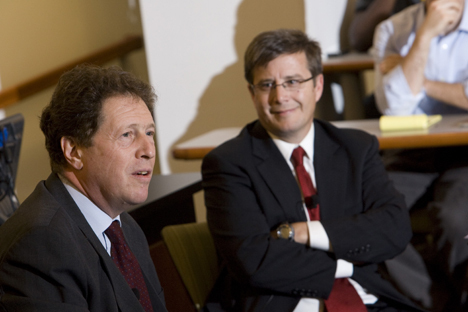 While President Barack Obama and Prime Minister Gordon Brown have both been preoccupied with domestic issues ranging from the economy to job recovery, Sheinwald said Brown’s goverment finds commond ground with the Obama Administration on many key policy issues including climate change, the international economy and Middle East strategy. Regarding the Arab- Israeli conflct, Sheinwald says Britain agrees with the Obama Administration’s efforts to help facilitate talks between Israel and Palestinians, noting that the conflict is central to stabilizing relations in the greater Middle East. On Iran, Sheinwald said Britain is working on a strategy to both engage and pressure the Iranian government, suing regional alliances and military support. “Sanctions are already having an impact on Iran,” he said. Concerning Afghanistan, Sheinwald said once the country is secured militarily, reaching a political settlement with the Taliban is essential. Sheinwald also discussed the current British elections and noted that no matter who wins, the relationship between the U.S. and UK will continue to be a priority. The event was sponsored by the program in American Grand Strategy, the Vice Provost for International Affairs and the Duke University Center for International Studies.